RMS Arabic (II) was an around 15,800 ton, two screw, one funnelled, four masted White Star Line ship that served White Star from 1903 until 1915. The construction of Arabic began in 1902 at Harland and Wolff, Belfast. Originally the ship was to be named Minnewaska and be built for the Atlantic Transport Line. However, during construction IMM which owned both White Star Line and Atlantic Transport Line decided to transfer the ship to White Star Line, who then chose to rename the ship Arabic. Harland and Wolf launched the ship as Arabic on 18th December 1902. White Star Line intended Arabic to sail on the Liverpool to America service. Her maiden voyage from Liverpool to New York began on 23rd June 1903, with her arriving in New York on 5th July. 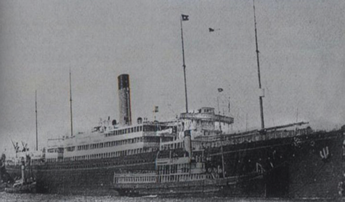 On 2nd October 1910, on a return voyage from New York, Arabic become White star’s last ship to call at Holyhead to drop off passengers. White star ships mainly called at Holyhead to allow passengers to disembark and board a train bound for London, and to get to London quicker than if they had stayed with the ship until Liverpool. Presumably this service ended as a result of the Liverpool service by now only being secondary to the Southampton service. During the First World War, unlike many other passenger ships, Arabic remained in commercial passenger service. While under the command of William Finch, on the morning of 19th August 1915, off the Old Head of Kinsale, Ireland, without warning Arabic was spotted and torpedoed by the German submarine U 24; Of the 434 people aboard the ship, 44 people lost their lives as the ship sank within just eleven minutes. Arabic was the first White Star ship to be lost during the First World War. As American passengers were aboard there was anger in America that the Germans had fired a torpedo without warning at the ship, especially after the death toll caused to American passengers after the torpedoing of the Lusitania just 3 months before. In response Germany agreed not to sink any passenger ships without warning, an agreement they kept to until 1917. Today the wreck of Arabic still rests where the ship foundered. Over the years salvage operations have taken place. Copyright © 2007-2012 White Star Line History Website Project. All rights reserved.